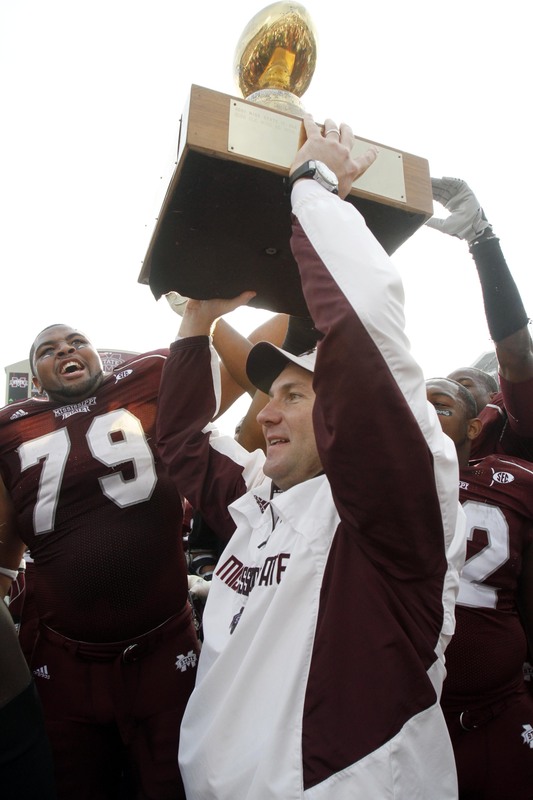 SDN Bulldog Blog – Gameday 2010 Week 13: Egg Bowl style vs. Ole Miss – Can State keep the trophy? Good morning readers and welcome to the pre-game blog edition as The SDN Bulldog Blog prepares to give you early coverage of a Saturday night contest as No. 22 Mississippi State (7-4, 3-4 SEC) travels to Ole Miss (4-7, 1-6) for a 6 p.m. kickoff on ESPNU in the Battle for the Golden Egg. It may be more than coincidence the lead character in the fable Humpty Dumpty is an egg. In the Magnolia State, it could be interpreted as a more than a fitting comparison to the coaches that roam the sidelines for the battle for the Golden Egg. The story plays out essentially the same way as the career path for these coaches at Mississippi State and Ole Miss. It begins with the mythical figure sitting on top of the wall. Enter Bulldogs second-year head coach Dan Mullen. The seat on top of the wall of this matchup currently has his name on it. His 2009 squad, which stumbled into last year’s Egg Bowl matchup with a 4-7 record, won the rivalry game 41-27 at Davis-Wade Stadium against an Ole Miss team that eventually won the Cotton Bowl and Mullen became only the second MSU head coach in school history win his debut in the state’s most important contest. After he hugged his athletic director Greg Byrne, Mullen then became the temporary discs jockey at Scott Field by taking a microphone and uttering a phrase used constantly throughout an offseason that almost ignored the fact that the Bulldogs didn’t qualify for a postseason game. Mississippi State’s current athletic director Scott Stricklin, who was the president of the Bulldog Club at that time, said it was discussed among the department that if MSU won, it was hoped Mullen would address the fans. “There’s certainly one program in this state that’s on the rise and headed in the right direction,” Mullen said after the game last November. This week Mullen stood by his comment suggesting historical evidence of the record of his team since that game is proof of his confidence in that statement. “Ever since that game to now, we are the program that’s on the rise and we plan to keep it that way,” Mullen said Monday. Mississippi State’s second-year head coach has created an interest in the rivalry with his constant verbal jabbing at the program he has referred to as “The School Up North” since taking the job in Starkville. Former Mississippi State head coach Jackie Sherrill took heat from the Ole Miss fan base by referring to the opponent as “Mississippi” but unlike Mullen’s calculated tweek to the people in Oxford who he admits “probably don’t like (him)”, the anger over Sherrill’s phrase confused the Bulldogs all-time wins leader. Even Mullen’s first-year assistants understand how crucial it is for their squad to get a victory in Oxford and the long-term consequences if they don’t accomplish this. Sherrill told the Starkville Daily News he knew the most important game he’d coach all season was the Egg Bowl against Ole Miss because the Bulldogs were always able to accomplish a season-long goal in one day. “What it’s like is you wake up the next morning and sit at the breakfast table trying to figure out how big your coffee cup is compared to everybody else,” said Sherrill, who owned a 7-6 record in the Egg Bowl from 1991 to 2003. Mullen, now with a favored team that is bowl eligible while facing a Ole Miss squad guaranteed for an under .500 record, will try tonight to become the first Mississippi State head coach to win his first two Egg Bowl games since Allyn McKeen accomplished the feat in the 1939-40 seasons. “I guess we plan on partying like it’s 1940,” Mullen said with a laugh. Conversely, the second line in the fable shows Humpty Dumpty having a great fall and once that fall occurs, all the king’s men can’t put it back together again. Enter the memory of recently departed coaches in the Egg Bowl. The parade of headset wearers that include Sylvester Croom, Ed Oregeron, Jackie Sherrill and Tommy Tuberville have one thing in common. Their final battle for the Golden Egg turned into their personal professional version of Waterloo by losing it big. Those four coaches, two from State and two from Ole Miss, lost their final Egg Bowl before a resignation or firing by a total score of 121-20. The last time State ventured into Oxford, it marked the final game of Croom roaming the sidelines wearing maroon and white. The next day after an embarrassing 45-0 defeat, Croom resigned leading then-athletic director hiring Mullen to replace him. The coach hoping to avoid anything breaking after another fall can be accurately described as current Ole Miss head coach Houston Nutt. The Rebels third-year head coach has admitted this week to taking the Egg Bowl game for granted after ending Croom’s head-coaching career with the 45-0 victory in 2008. However, Nutt has been humbled after last year’s loss and currently going through a disappointing 2010 season leaving his program unlikely to be in a bowl game. Similarly to Mississippi State’s mood this weekend, Ole Miss suffered a draining 43-36 loss at No. 5 LSU when the Tigers rallied for the game-winning touchdown with 44 seconds left. Nutt has said he coming from Arkansas that doesn’t have an in-state rival, didn’t fully understand the importance of the Egg Bowl game until he lost it in a big way last year in Starkville. A loss in Oxford may be seen as a big fall that could break any momentum the Rebels built up after back-to-back Cotton Bowl trips. Mullen has publicly understood the significance since he got off the plane at Golden Triangle Airport with Byrne. All of the SDN Bulldog Blog readers: feel free to follow me on Twitter at http://twitter.com/matthewcstevens for up-to-date Mississippi State coverage. November 27, 2010 in Football. SDN Bulldog Blog – Gameday 2010 Week 9: vs. Kentucky – Can State get win No.7? SDN Bulldog Blog – Gameday 2010 Week 12: Senior Night vs. No. 13 Arkansas – Can State stop Hogs air attack? SDN Bulldog Blog – Gameday 2010 Week 11: at No. 11 Alabama – Finally…a football game to cover! ← Come join The SDN Bulldog Blog Facebook page!